Cromwell Littlejohn and John Cohen at Merle Wood & Associates are offering 10 days charter for the price of seven aboard Trinity's 45m motor yacht Claire for all bookings received before January 31st 2012. Accomodating 10 guests in five staterooms cared for by nine crew, Claire is in excellent condition having just completed a $1 million refit including new decor, audio/visual systems, large screen televisions on all exterior decks and a new aft deck dining area that converts into a theatre lounge. 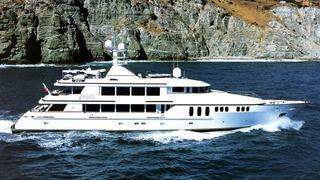 Available in Florida, the Bahamas and the Caribbean this winter and Florida, the Bahamas and New England in summer 2012, the charter rate on Claire begins at $150,000 per week plus expenses.